Received August 2, 2018; Accepted October 11, 2018.; Published online January 2, 2019. To identify the histone-modifying enzymes regulated by USP44, we screened a panel of several histone-modifying enzymes for their interactions with USP44 by immunoprecipitation assay (Supplementary Fig. S1). We found that USP44 interacted with EZH2 and the interaction between USP44 and EZH2 was dependent on USP44 catalytic activity (Figs. 1A and 1B). EZH2 binding to USP44 was only detected for wild-type USP44, but not for the USP44 catalytic mutant (C282A) with disabled deubiquitinating activity. 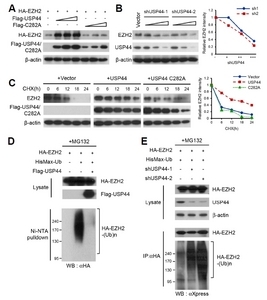 In the metastatic prostate cancer cell line DU145, we verified the endogenous interaction between USP44 and EZH2 (Fig. 1C). 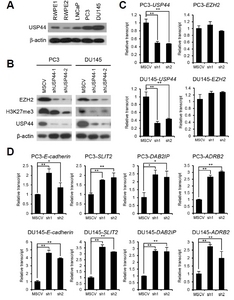 We next confirmed the nuclear co-localization of USP44 and EZH2 in PC3 and DU145 cells by immunocytochemistry (Fig. 1D). In DU145 cells, the ectopically expressed wild-type and USP44 catalytic mutant resided in the nucleus, indicating that the lack of an interaction between USP44 catalytic mutant and EZH2 was not due to a difference in cellular localization (Fig. 1E). We demonstrated that USP44 increases the tumorigenic abilities and CSC-like behaviors of prostate cancer cells. To assess whether USP44’s effect on oncogenesis are attributed to EZH2 protein stabilization, EZH2 was introduced in USP44 knockdown prostate cancer cells (Supplementary Fig. S3). 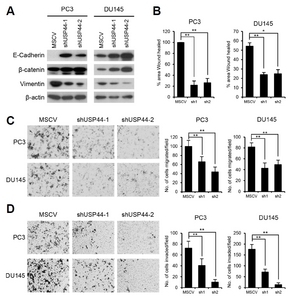 Introduction of EZH2 significantly rescued the USP44 knockdown-induced suppression of wound healing, migration, and invasion activity both in PC3 and DU145 stable cell lines (Figs. 6A–6C, Supplementary Figs. S4A–S4C). Furthermore, the decrease in the size and number of spheres by USP44 knockdown was restored to the control level by EZH2 introduction (Fig. 6D, Supplementary Fig. S4D). In summary, overexpression of EZH2 restored the tumorigenic abilities that were decreased following USP44 knockdown in prostate cancer cells. These results demonstrate that USP44 promotes prostate cancer cell tumorigenesis, in part by stabilizing EZH2. Fig. 1. (A) HEK293T cells were transfected as indicated. Each cell lysate was immunoprecipitated with a Flag antibody followed by immunoblotting with Flag and HA antibodies. (B) HEK293T cells were transfected as indicated. Each cell lysate was immunoprecipitated with HA antibody followed by immunoblotting with Flag and HA antibodies. (C) Immunoprecipitation of USP44 from DU145 cell extract using an USP44 antibody followed by immunoblotting with USP44 and EZH2 antibodies. (D) Immunofluorescent staining of USP44 and EZH2 in DU145 and PC3 cells. 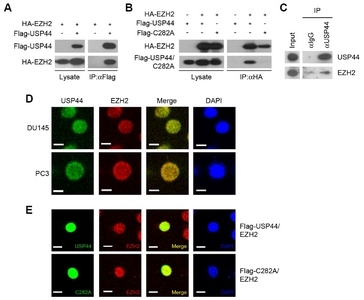 USP44 was stained green and EZH2 was stained red. 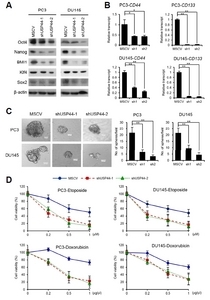 (E) DU145 cells were transfected with Flag-USP44 or Flag-USP44 C282A. Flag-USP44 or Flag-USP44 C282A was stained green and EZH2 was stained red. The blue signal represents nuclear DNA stained by DAPI. The bar indicates 10 μm. Fig. 2. (A) HEK293T cells were transfected as indicated and each cell lysate was immunoblotted to detect HA-EZH2 and Flag-USP44. (B) USP44 shRNA was transfected as indicated and protein from each cell lysate was immunoblotted to detect EZH2 and USP44. Line graph representing the relative protein levels of EZH2 normalized to β-actin. (C) Mock or Flag-USP44/USP44 C282A-expressing HEK293T cells were treated with cycloheximide (CHX) for the indicated times. Equal amounts of protein were used to detect EZH2 by immunoblotting. Line graph representing the relative protein levels of EZH2 normalized to β-actin using a densitometer and expressed as the relative intensity compared to the non-treated control. (D) HEK293T cells were transfected as indicated and treated with MG132 for 12 h before harvesting. Each cell lysate was subjected to Ni-NTA pulldown followed by immunoblotting with HA antibody. (E) HEK293T cells were transfected as indicated and treated with MG132 for 12 h before harvesting. Each cell lysate was subjected to immunoprecipitation with HA antibody followed by immunoblotting with Xpress and HA antibodies. Fig. 7. 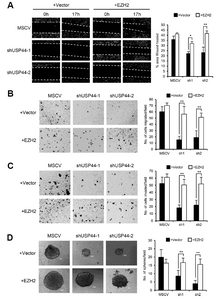 (A) Interaction of USP44 and gain-of-function EZH2 mutants was verified by immunoprecipitation. (B) HEK293T cells were transfected with Flag-USP44 and HA-tagged gain-of-function EZH2 mutants. 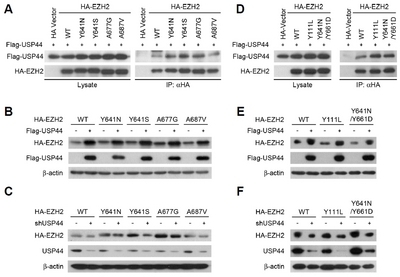 Equal amounts of protein from each cell lysate were immunoblotted to detect HA-EZH2 mutant and Flag-USP44. (C) HEK293T cells were transfected with shUSP44 and HA-tagged gain-of-function EZH2 mutants. Equal amounts of protein from each cell lysate were immunoblotted to detect HA-EZH2 mutant and USP44. (D) Interaction of USP44 and therapy-resistant EZH2 mutants was verified by immunoprecipitation. (E) HEK293T cells were transfected with Flag-USP44 and therapy-resistant HA-EZH2 mutants. Equal amounts of protein from each cell lysate were immunoblotted to detect HA-EZH2 mutant and Flag-USP44. (F) HEK293T cells were transfected with shUSP44 and HA-tagged therapy-resistant EZH2 mutants. Equal amounts of protein from each cell lysate were immunoblotted to detect HA-EZH2 mutant and USP44.